In tune with the varied demands of our prestigious clients, we are offering a superior quality Pressure Module. 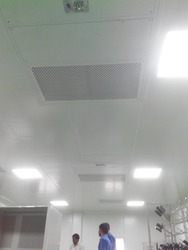 The offered product is designed to provide clean air and creating positive pressure in the room. The working principle of this positive pressure module is almost similar to the laminar airflow. This pressure module is designed with utmost precision and quality checked on several parameters to meet the industrial norms. Further, we offer this pressure module at cost effective rate. Looking for Pressure Module ?